Continuing the instructor's courses; this volume begins showing exactly how to teach the Yang Cheng-fu form, which is also pertinent to all other forms. Erle shows some of his tricks of the trade so to speak, in trying to get new students to understand how to move correctly. It's not enough to learn a form and then go out and show someone else how to do it; you must also know HOW to teach it. And this is what Erle teaches on this volume. Also covered is the continuing 'bumping arms' practice, taking you more into the advanced methods of this wonderful conditioning exercise which is great for those students beginning their Tai Chi or Bagua training as it shows them that there is another side to the internal arts other than just a dance or health exercise. 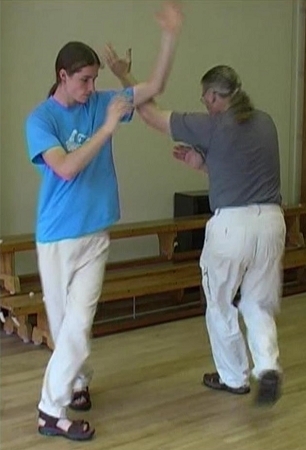 Also covered is the Tai Chi Chee Sau, or Sticking Hands, adding some foot work to the basic hand movements. If you are interested in becoming an instructor or already are one, then this series is definitely for you. The form itself is covered in such detail that a ruler is almost required to get the exact positioning of the arms hands and feet. And Erle also gives his acquired anecdotes in order to teach beginners exactly how, when and where to move their hands and feet.